Its been a little while since I’ve been able to do this, but I’m sharing one of my favorite types of posts today. It’s quilling tool review time! This week’s product that has been on my radar for a few months. But, because I’ve been cranking out the Christmas and Valentine’s posts, I haven’t been able to play with it. Now that I’ve gotten some of those tutorials out of my head, I have some time to experiment and review a quilling paper husking board. The husking board I bought was ordered online and is from the brand Juya. It is available in either blue or pink. I don’t think I was given a choice, and I ended up with the blue version. They call it a “quilling knitting board”, which is a new phrase to me. I tried to find some other research about this term, but I couldn’t find any other instance of quilling and “knitting” going together. This quilling paper husking board is a thin, plastic rectangle, measuring about 6 inches long by 3 inches wide. It’s covered in small holes. The top section is an arch pattern; the bottom is straight lines. There is also a small drawer to the side, that holds 32 sticks to use in the holes along with your quilling paper. I did like the little drawer, but I found that it does get stuck somewhat when I would try to push it back in. Most of the pins are solid stainless steel, but 2 are copper and have slots running down them. These are the ones that are meant to be for the starting point. Just like a slotted quilling tool, the paper gets placed in the slit, and then wraps around the post a bit. I have to say, I had some trouble with this part. I found it really difficult to keep the paper in the slot while the pin was in the board. Instead, I had to wrap it in my hands first, then place the pin in the hole I needed it to be in. It’s not the easiest way to do things, but it seems to work. If you need a refresher on how to do it, check out this post on the husking technique. You use the husking board in the same way that you would use straight pins and a cork board. First, decide on the design you would like to create by placing the pins in the corresponding holes. Then, starting with the slotted pin, wrap your quilling paper strip over and around the pins. With most designs, you’ll begin wrapping your quilling paper around the pins closest to the slotted one and work your way out. When you’re done, tear off any excess paper, fold or squeeze your design if needed, and glue the end to keep everything together. I used tweezers to remove my flower petals from the board. I did find them really easy to remove from the board, because there is no round head, like with regular straight pins. To really get a feel for how this husking board could work, I recreated the poppy flowers that I made in that first husking tutorial. Even though I had to estimate where to put the pins, the finished flower looks pretty similar to the original version where I followed the drawn template. Another interesting feature of this husking board is the straight channels on the bottom half. There are 4 vertical grooves and 22 horizontal ones. Without any real direction, I wasn’t 100% sure what to create with this section, but I attached a few strips together, using the channels to keep them in place. I did have to use my needle tool to help the strips on out again, but once I did I was able to recreate one of the examples on the back of the box. The grid is perfect for reproducing the same exact shape over and over again. All in all, I think this husking board would be helpful for those crafters who are making loads of similar shapes, like a scene with a large number of flowers, for example. I did find it a little difficult to picture where to put the pins to get the finished shape I was looking for. When using pins and a corkboard for husking, I would draw an outline first, then put the pins on top of that. I think this might be a little easier for how my mind works. Maybe I just need to practice on with the husking board a bit more. Another con is the size of the pins. They are very short, compared to my straight pins. They’re really not that much longer than my quilling paper strips! It takes some practice to figure out how to maneuver around them because they’re so tiny! Bear in mind, this is only my personal experience. This husking board has gotten very good reviews from other quillers. 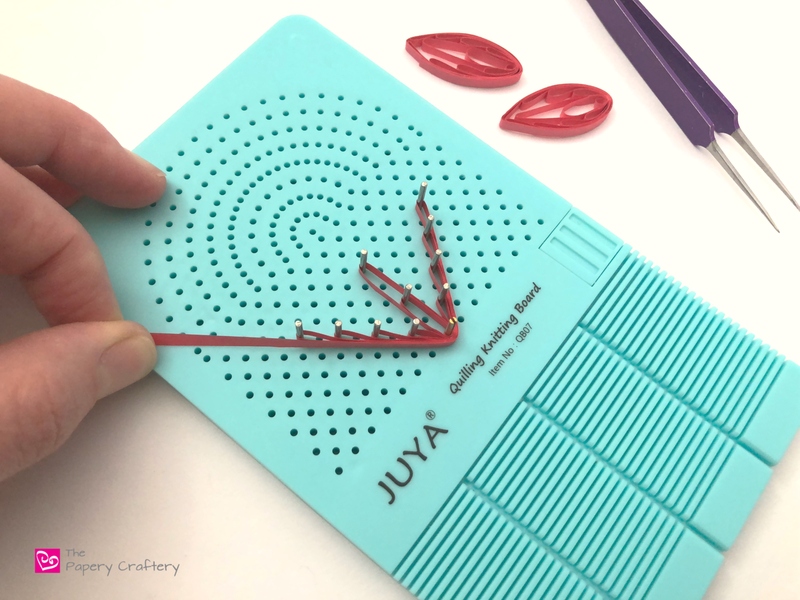 For under $10, this might be a worthwhile tool to have in your quilling toolkit! Have you tried a husking board? Do you prefer it over using your own pins and a cork board? I purchased the board and it does have a learning curve. I have yet to use the section at the bottom with the straight lines. I’ve tried using my pins and cork board and even Styrofoam and that works well. I have the holes to use for the next piece so they are all the same size. When the board pins come out when removing shapes, I sometimes lose my place. I have to use tape to mark off the positions. Everything takes practice. Thanks for the advice, Barbara! I have a husking board and I really love it, mainly because the pins don’t have heads on them! I also love that it has a drawer for those pins so they don’t get lost.I found it interesting that the slotted pins are used the way you described (though it’s perfectly understandable now that you explained it to me!) I’ve always just made a small loop that fits around the first pin and glued it in place and gone on from there! Who knew? So nice to keep learning new things! Thanks! So glad to help, Sharon! i have a husking board, and totally love it! mine is from yurroad and i also bought it online, but it only has 20 pegs and one slotted peg. where you have grooves on the bottom, mine has a series of holes for the pegs. it’s wonderful for making squares and rectangles. as far as getting started, meredith, i put the slotted peg in the hole, slide a paper strip in, and holding the paper on the peg closest to me, i wrap to the next peg then glue when i get back to where i started. also, if you are doing a design that has the pegs close together, put them in as you need them. pull your paper strip away from you, put in the peg, wrap and go back to the starting point. it works really well this way. thank you so much for sharing your information and your thoughts with all of us. Thanks for the tips, Jan! I just received my Husking Board and am anxious to try it. I have used the cork and pin technique and get frustrated when the pins come out as I’m working. Hopefully this works better for me. I hope you have good luck with the new board!